Heat oven to 375°F. Spray large cookie sheet with CRISCO® Original No-Stick Cooking Spray. Separate dough into 8 biscuits; place 3 inches apart on cookie sheet. Press out each biscuit to form 4-inch round with 1/4-inch-high rim around outside edge. In small bowl, beat 1 of the eggs. Brush over tops and sides of biscuits. Sprinkle with 1 teaspoon of the Italian seasoning. In another small bowl, beat remaining 2 eggs and remaining 1/4 to 1/2 teaspoon Italian seasoning. Spoon egg mixture evenly into indentations in each biscuit. 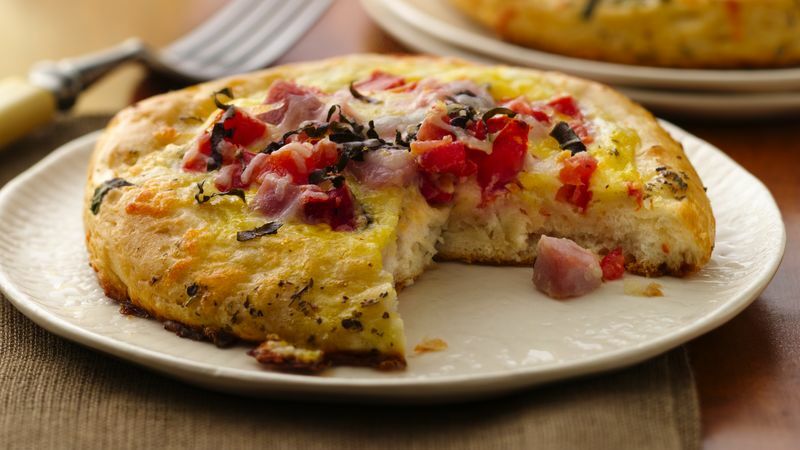 Top with ham, 1/2 cup of the cheese, the roasted peppers, tomatoes, sliced basil and remaining 1/2 cup cheese. Bake 15 to 20 minutes or until biscuits are golden brown and eggs are set. Garnish with basil sprigs and cherry tomatoes.